Join Park Ranger David Owens on a wild walk, crawl and scoot through some of the most remote areas of beautiful Penitentiary Hollow. 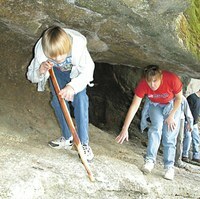 This is a strenuous walk involving some crawling through tight spaces in rock cracks, crevices and short caves. Held at Lake Mineral Wells State Park, 100 Park Road 71, Mineral Wells, TX, 76067.